One of my favorite parts of summer is devouring all the fresh fruit: strawberries, blueberries, pineapple, cantaloupe… it’s all good! Then winter comes and takes it all away, and I’m left with are apples and grapes. Don’t get me wrong; I like them! But I miss my berries. Maybe for you it’s zucchini, or corn. What’s a girl to do in the off-season months? 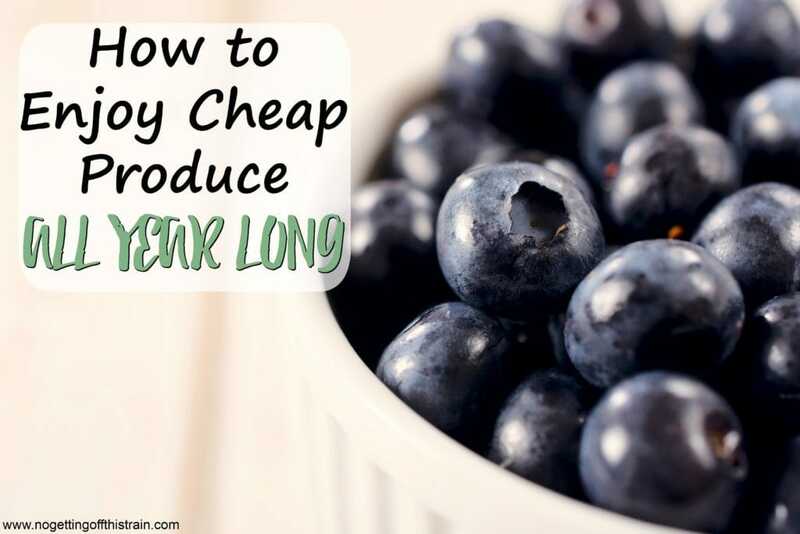 Luckily, I realized I can enjoy cheap produce all year long- and it starts with the beginning of the season. Don’t you love it when strawberries go on sale for $.99 a pound? It’s my dream come true, especially since Allison’s now decided that strawberries are the only fruit for her! I buy 4 or 5 containers at a time to really take advantage of this cheap produce. 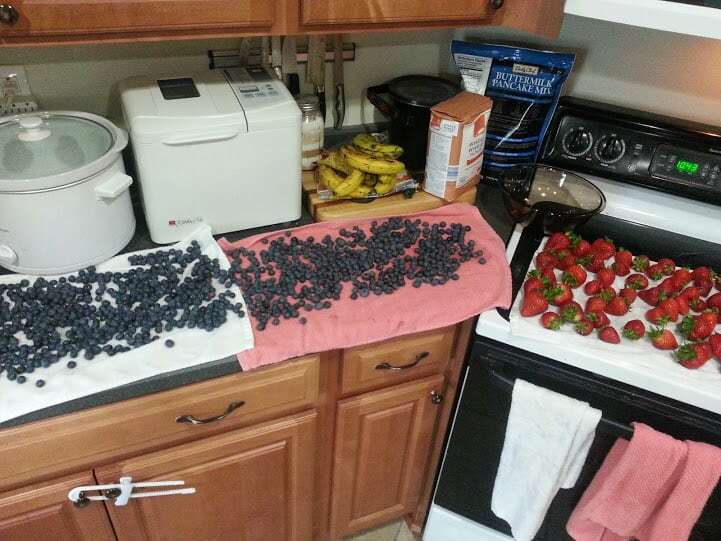 Now since there are only 3 of us, it would take a lot of effort to eat all of that in one week, so here’s my secret: I freeze leftover cheap produce. 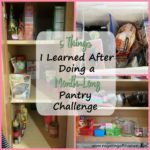 Yep, that’s my simple secret, and you can do it too! I love this picture, because it really encompasses how much I love fruit- and how crazy I must look for buying all of that. Pretty much all of that went in the freezer for later use. 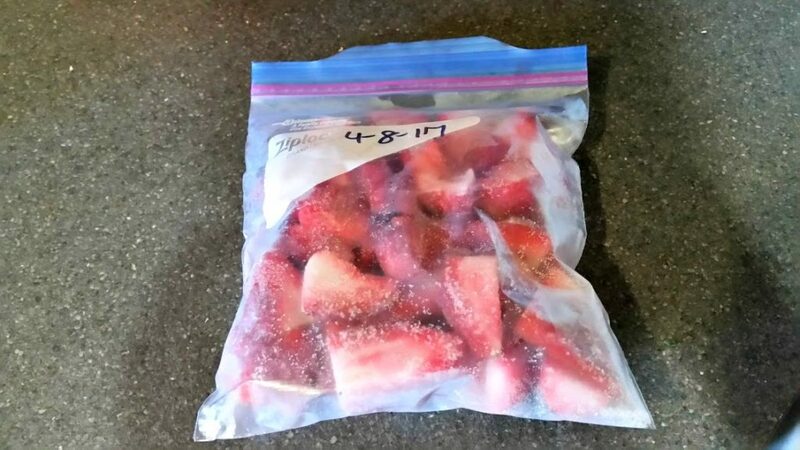 Once you clean and dry your fruit, flash freeze them on a cookie sheet lined with parchment paper (chop the strawberries in half if you want to), then transfer the fruit into a freezer bag. It’s so easy! There are many other fruits to try and freeze, but these are my favorites and I’m sure others would freeze well, too. 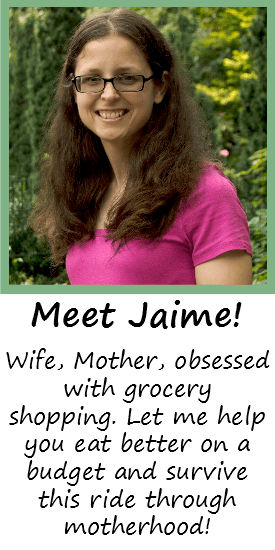 You can also do the same thing with vegetables- zucchini, corn (shaved off the cob), green beans, squash (yellow and butternut), and many other seasonal vegetables as well. Now here’s the important part: Thawing out your frozen produce will not give it the same texture. Once you freeze produce, it’s best used in recipes where texture doesn’t matter, like soups, casseroles, smoothies, and baked goods. My favorite is adding frozen strawberries/blueberries to my yogurt and granola! Mushy produce is no good, but once you cook it in a recipe, you won’t even notice it was once frozen. I know it’s not quite the same as eating a fresh strawberry, but you still know where it came from and how it was frozen and stored. And that’s good enough for me! 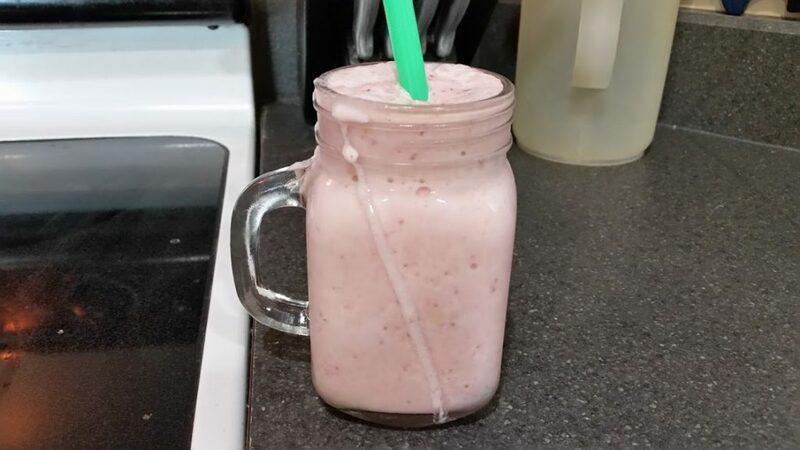 Blend all the ingredients in your blender until fully mixed! What are your favorite fruits and vegetables to freeze? Leave a comment and give us ideas! I have always froze Corn ON the cob.Clean and rinse corn. Then freeze. Do not let it dry first. Do not blanch. When ready to cook it. Steam it. Almost like fresh . Good idea, thank you Sheryl!